s the best material to use for chairs description shown by Fig. 80. Fig. a sectional elevation of the legs and S2 an elevation of the back. A thin mould for the back legs should first de to the dimensions given in Fig. 81. lining out, cut the legs out of wood, and dress them up to the of the mould. From the bottom of the seat rail, taper the legs, the side only, to 1 in. thick at the [see Fig. 82). Mortise the legs for *t rail and stay rail, which should ioned as shown at Fig. 83, and rebate Aide edges of the upper part of the in. deep, leaving a belt } in. wide, should be rounded to form a bead lection, Fig. 84). The shaped top i finished to the same width as the and is rounded in the same way, secured to the top end of the legs dowels. Prepare the front legs as . in Fig. 81. 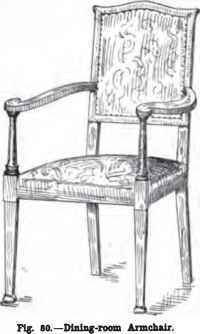 The part above the mil, forming the pillar for the arms, ned, while below the seat rail the tapered, and shaped at the foot as • This done, cramp the legs and ogether. Draw a full-size plan of *t, to give the bevels and shoulders i aide rails. The part plan (Fig. 85) the positions of the tenons. The tenon on the back rail allows nan of the side rail to pass it, thus strength to the side rails where it it needed. Make a thin mould for WB (Fig. 86), which are 1J in. thick lat-rounded on the edges. 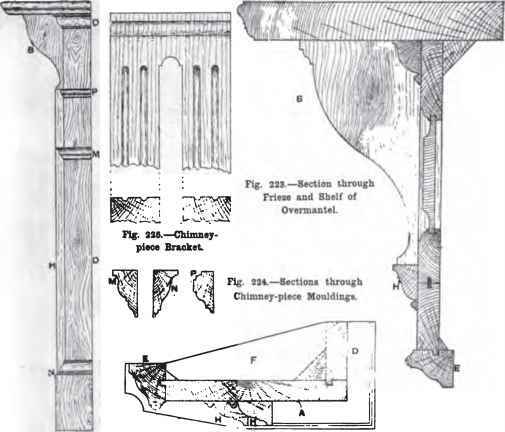 After fitted to the back legs, each is secured with glue and a screw, which is driven through from the back and sunk below the face, the hole being filled with a wooden plug (see Fig. 86). In the front of the arm is bored a hole } in. in diameter for the pin turned on the leg pillar.